Visit the most beautiful attractions in Paris and enjoy panoramic views of the city! The Tour of Paris with a visit to the Eiffel Tower is the perfect way in which to enjoy the very best of what the French capital has to offer as you sit in comfort on board a luxurious coach. 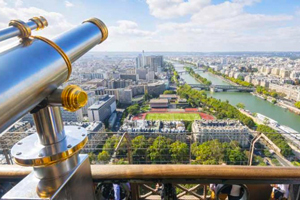 Visit the city's most beautiful attractions and at the end of the tour, you will be able to enjoy the spectacular panoramic views of the city from the 2nd floor of the Eiffel Tower. We aren't talking about a simple "Hop on / Hop off" service but the chance to enjoy a properly organised tour that has been designed specially for all those who want to get to know the wonders of Paris. Don't miss this opportunity: Check the dates for your tour with an English audio-guide now by clicking on the icon "Book Paris Tour. The Tour of Paris with a visit to the Eiffel Tower is designed for those who want to enjoy the very best of Paris in a short time. In fact, thanks to the knowledgeable commentary on the audio-guide, you can also have fun finding out about the history of some of the most prestigious monuments in Paris such as: Nôtre Dame, the Opéra Garnier, the Louvre Museum and the Musée d'Orsay, the Eiffel Tower and the Arc de Triomphe. The tour ends at the entrance to the Eiffel Tower from where you will be able to admire the beauty of the French capital from on high from this iconic building's 2nd floor. In other words, be prepared for getting to know Paris like a true Parisian. This tour is highly recommended for the first day of your stay in the capital so that you can get your bearings and thus choose more easily, which attractions you want to see at a later stage of your visit. From the 1st November until the 31st March: every day starting at 09:00, 12:00 and 14:45 hours.